So, the verdict has been pronounced: eight years in a high security penal colony. We already mentioned this topic earlier today. Vladimir Putin firmly stated during his press-conference that the investigative committee felt that they had all the required evidence. I, however, recall what happened last year in November. Putin had dismissed Uliukaev for loss of confidence. The Kremlin’s press-secretary Dmitry Peskov assured that ever since the beginning the president was well aware of the details of the preliminary investigation. And I remember very well the words pronounced back then, a year ago, by a high-ranking official: “there is enough evidence”. You would think that the sentence had already been though up then, that is had already matured and that from then on Uliukaev’s guilt had become an unshakable certainty, regardless of what ingenuity the defence could deploy in their reasoning and argumentation. The die was cast. But why Uliukaev? And who is behind this grim verdict? Is it Vladmir Putin himself? Or is it Igor Sechin? We still do not have answers to those questions. But we would like to have them. 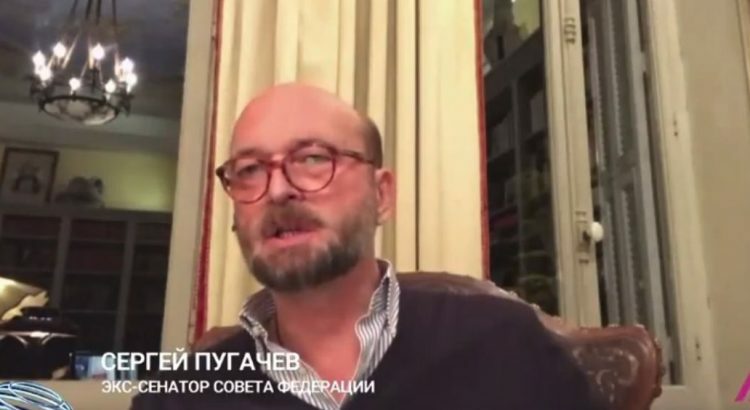 Sergei Pugachev, former senator, has connected to us by Skype. – Good evening Sergei.Would you be able to tell us what happened, according to you? How do you understand the culmination of this trial we have been following? – I understand, I have heard a few comments in this respect… But I believe that the independence of the judiciary in Russia was lost long ago. It long pre-dates Uliukaev’s trial and the sentence that was issued against him. – Yes, this is clear. – … It goes back to 2003, when the YUKOS case began. That was a first attempt, they were experimenting. This is quite interesting. In fact, Putin has always tried to have the law enforcement under his control, above all the judiciary. I remember very well how it was. I remember the clashes between different people over the appointment of judges and prosecutors, and so forth. We all know for example that our current president of the Supreme Court is a virtually permanent figure, who by now has practically all the branches of the legal system in his power: the commercial branch and all the others, too. But of course he himself decides nothing: all the decisions are taken in the Kremlin, obviously. And the YUKOS case was a first shot they had at it, so to speak. – And the sentences are prepared in the Kremlin? – Naturally. All the sentences are prepared in the Kremlin. – In cases of that type, you mean? – Yes. That is a fact. I know it. – So this sentence was written in the Kremlin? – Yes, there is no doubt about that. Such things are never decided otherwise. And there is no point in trying to think up alternative versions, imagining that Sechin might have been at the roots of all this, because he has such a great influence, and all that. This is clearly a decision that was taken by Putin, under influence from his entourage. And it is quite pointless to try and guess what Uliukaev could have done so wrong. Uliukaev ihas done nothing so terribly wrong, he is flesh of the flesh of this system of bureaucrats and officials. He is well aware of that, by the way. It was obvious when he apologised publicly, etc. – Yes, indeed. He said that he had compromised on some things and that he was part of the system. – I would go even further. I know him well, I have known him for many years. In this specific case it is obvious that no crime was committed. There was no corruption in this particular case. But the whole system of the Russian public service is based on it – the government, the state management… everything. I can tell you that when Putin came to power, he was still under criminal investigation conducted by the Petersburg Procurature. – Who was? Poutine himself? – Yes, Putin and Kudrin. And later, as they climbed the career ladder, this case was abandoned. But at the earlier stages Putin had to be interrogated and all such things… The case was abandoned, but I think it left a deep mark on him. It made him understand that whoever held the key to that door, had in his hand the destiny… the destiny of Russia in his case. – Yes, yes, indeed. I see. But let us get back to today’s events, shall we? You have said that the decision was taken by Putin. When do you think he took it? Was it when the arrest took place, a year ago? Or was it decided recently? – Of course not. Clearly not. Such things are always decided well in advance. You mentioned his speech, in which he said that everything was clear, that he had been following the investigation and that he had a good understanding of things. You know what that means, don’t you? How do you think a tribunal works? YUKOS is case in point. The judges were writing up the decision in a sanatorium under the guard of the Federal Security Service, and sending it page by page to the Kremlin, where Medvedev, Sechin and others, starting with Putin, of course, would read it and discuss the number of years: should he be sentenced to twelve years, or ten years and a half, or ten years and two months… It was plain bargaining. I remember it so well. I was stupefied. – Yes, I understand quite well. I understand the parallel you are drawing with YUKOS. I understand how the YUKOS case originated, at least I have the impression that I do. One has an idea of what was going on back then, what was at stake, why it happened and how. But I really do not seem to understand what is going on with Uliukaev. Do you understand the reasons for all that? – Of course I understand! In the case of Uliukaev it is very simple. Uliukaev is the Minister for Economy. Currently, in the context of Western sanctions (and you know that a report will be submitted to the American Congress in February and that the sanctions will likely be ramped up), there is a shortage of funds in Russia. And Uliukaev was the Minister for Economy. Economy! Not the Minister for Sport, or something like that. In other words, he was the one who determined the allocation of funds in the coming budget. – And so? What conclusion is to be drawn from it? Did he balk at something? Did he misconduct himself in some manner? – No, he did not… You just can’t please everyone, that is all. – So you are implying that he trod on somebody’s toes? – No, not necessarily. But you see, when there is not enough money, but when everyone has got used to spending and not counting, to using budgetary funds for private needs and wishes, coming to see Putin and saying “oh, by the way, we need to increase three-fold the budget for the construction of the Kerch bridge”… and then suddenly Uliukaev says “no, in fact there is no money, and there won’t be any”. Uliukaev then becomes a very annoying person. And Uliukaev is not the only one to have such a post. I would venture to say that Sechin occupies a very similar post. Rosneft is currently one of the few companies to have some resources. So, to sum it up, this is by no means a specific and personal attack targeting Uliukaev, because he allegedly failed someone or held too staunchly to his position… No. – Oh, I am sorry, I was certain to have sent it. – Yes, I see… But this episode probably dates back to the time before Uliukaev was appointed minister. – Here. You see: Sechin… Uliukaev. – It is truly deplorable that Uliukaev received this sentence today, which, in this specific case, is baseless. But you have to realise that after Putin came to power, Russia said farewell to the independence of the judiciary. And I say nothing of the police, the FSB, the Procurature, and all the rest of it – the investigative committees, etc. I have to regularly face this myself. If you go back seven years, to 2010, say, the examination of cases took years, the lawyers drew up statements… If you compare to how things work now, you realise that the judicial process has become purely fictitious. This stands for virtually any legal decision. And here you have just witnessed one more example of it. Here is a Minister for Economy, who has just been sentenced to eight years in a high security penal colony, based on a completely unfounded verbal testimony. – Thank you very much! This was Sergei Pugachev.